TNA wrestler Rob Van Dam says he does not believe his character has been "utilized to the fullest" since coming to TNA in 2010. "I don’t want that to come off as a complaint because I really like my deal with TNA. I’m very professional and there for whatever they need me to do. Having said that, I still care about my character and my career, and I’m very easy to get along with," Van Dam told Scott Fishman of the Miami Herald in a lengthy interview. "I’m not one guy to complain that they should be doing this with me or that. I will offer some ideas up, and at the same time, give my opinion to the writer and stuff like that. It doesn’t do any good to throw out that negativity out there. Everyone has a job do." The part of the interview receiving the most attention is RVD saying he feels like there's a lack of respect toward him from younger wrestlers in the locker room. RVD singled out the Young Bucks (formerly Generation Me in TNA), who have since responded. “I feel like I get respect, but not in that way (seeking advice),” Van Dam said. “I’m open to it. Most of the guys, I don’t know if they don’t feel welcome to ask me or any of the other veterans or what. That is probably an issue that we have is the young guys should ask some of the older guys. They should be saying, ‘Hey, watch my match. Let me know what I can improve on,' Van Dam said. Matt Jackson a/k/a Max Buck replied on Twitter: "I never introduced myself to (RVD)? Then who was that guy who wore jean shorts & Golds Gym tank-tops, that I met & always said hi to? "I'm a 26 yr old, married man w/a child on the way & have been wrestling 8 yrs around the world. I'm not a kid but thx for the compliment!" Backstage in TNA, RVD's reputation is a veteran who just shows up to "do his thing." He's not looked at as a locker room leader, nor is he expected to be one. The sentiment among long-time TNA wrestlers is he's not doing anything to earn respect - he doesn't approach younger wrestlers to offer suggestions to improve. Whereas, other wrestlers with his experience and tenure in the wrestling industry will offer advice, which has earned them respect in the locker room. To RVD's defense, many of the younger wrestlers, in general, have a reputation for being closed-off and not actively seeking advice, which could be where RVD is coming from. Also in the interview, Van Dam talks about TNA lacking mainstream exposure and changing the emphasis of the company name from "TNA" to "Impact Wrestling." “We don’t have it (brand recognition,” Van Dam said. “We have less than a handful of third-party licensees, whereas the big companies like with WCW there were a lot more. When they were around, they had a couple a hundred licensees. We need to get the TNA Impact Wrestling brand out there." Van Dam expanded on his thoughts in this area and several other objects in the interview at miamiherald.com. 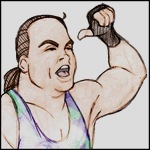 Caldwell's Analysis: A strong part of Van Dam's marketability is how carries himself with that sense of having a higher opinion of himself than is actuality. It can also be to his detriment, as exemplified by some of the quotes in the interview puffing himself up. Part of why he isn't viewed as a locker room leader is the in-ring performances he's had in TNA this year. He's clearly been going through the motions and sleep-walking through matches in 2011 despite being positioned in main events with Sting and other top stars. There's a sense of RVD simply coasting because he was handed a top position in TNA without truly earning it.